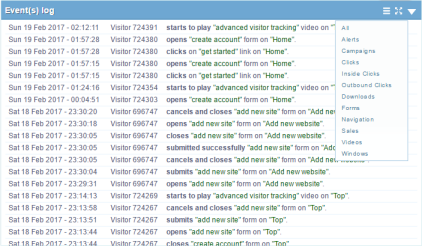 This report displays the interactions between visitors and your website pages. For each interaction, a line is displayed specifying the name of the visitor (or its identifier), the action performed and the name of the page or the interaction was detected. There are several categories of interactions: alerts, marketing campaigns, inbound and outbound clicks, downloads, forms, sales, videos, and windows. You can select the interactions displayed by selecting a category from the menu in the box. By clicking on the name or the identifier of the visitor, you have access to their detailed card. For clicks, or videos, you can see the destination link by moving the mouse over the description of the interaction. The maximize icon allows to enlarge the box. The "full screen" and "search" buttons will soon be added.